Texas A&M WR Mike Evans: "His father, Mickey, was murdered when Mike was 9." NIU safety Jimmie Ward: "Has a child." Oregon TE Colt Lyerla: "Grew up poor in an unstable environment." 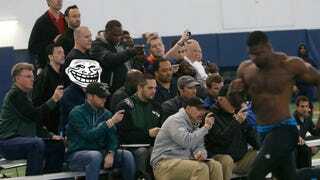 The man behind all these evaluations is Nolan Nawrocki, known around some parts as Trollscout. Perhaps most famous for his dog-whistle evaluations of Cam Newton and Geno Smith for Pro Football Weekly, Nawrock is now part of the official NFL media machine. Last month we caught up with Nawrocki at his home outside Chicago to try to find out what makes the NFL's most infamous draftnik tick—and to find out what he thinks really matters in the players he scouts.